Please watch the video and answer the questions together below. What did Jesus do for the paralyzed man? How does Jesus show He cares for us and others? ​What are some ways you can follow Jesus' teachings? ​Please watch the video and answer the questions below. Every time we receive Communion Jesus helps us to be strong enough to love and to serve others. When Jesus give us this strength, we call Him the Bread of Life. How does the bread we eat at home make us strong? How does Jesus, the Bread of Life, make us strong? The Last Supper was held the Thursday before Jesus died. We now refer to that Thursday as “Holy Thursday”. Jesus celebrated a meal with His Apostles. Meals are a time to bring people together and share food. 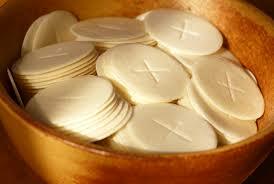 Jesus chose a meal as the time to give us the Holy Eucharist, his own body in the form of the host. Jesus shared this important meal with His Apostles (friends) because He loved them so much. In order that all people in God’s family (that means YOU and ME!!!) can receive this great gift of the Eucharist, Jesus gave to His church, through His priests, the power to do exactly what He had done at the Last Supper. At every Mass we celebrate that first Mass at the Last Supper over again using the very same words Jesus used then. Jesus took bread and gave thanks to God. He said, "This is my body," and gave the bread to His Apostles. Then He took a cup of wine and said, "This is my blood." He gave the cup of wine to His apostles. The apostles ate the holy food. Jesus told his friends, "Do this in memory of me." At Mass, Jesus gives priests the power to change the bread and wine into Jesus' true body and blood. At communion time when the priest says “The Body of Christ” and “The Blood of Christ”, the priest is actually asking each of us “Do you believe that this is the body and blood of Jesus?” When we answer “Amen” we mean “Yes, I do believe this is Jesus!” At that moment our hearts are joined with Jesus. After receiving the Eucharist, kneel and talk to Jesus silently. He wants to give you all the love you need. After you receive communion and are back in your seat, thank Jesus for coming to you. Quietly share a few moments with Jesus in prayer. Jesus comes to you each and every time you receive Him in the Eucharist. He stays with us this way because He loves us so much! Parent(s) - Explain to your child how it makes you feel to receive the Eucharist at Mass. Child - Talk to your parents about how you are feeling about receiving your upcoming Sacrament. Are you nervous or excited? 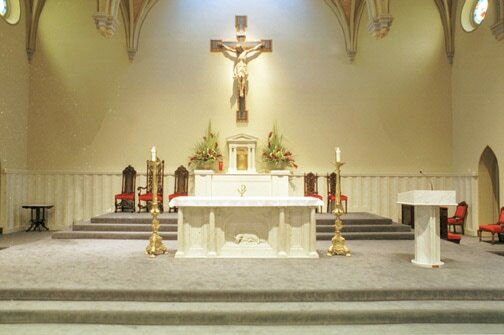 Tabernacle - The tabernacle is the metal casing or box located in the sanctuary where the Blessed Sacrament is kept. 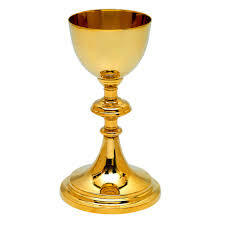 Chalice - The chalice contains the wine used at Mass. Alter - The altar is a table that we gather around to celebrate Mass. The bread and wine become the Body and Blood of Jesus. Paten - A shallow bowl used to hold the unleavened bread during Mass. Hosts - Hosts are unblessed bread used for Communion. Candles - Candles are lit to remind us that Jesus is here. Jesus is the light of the world. Show your child how to hold their hands to receive the bread. Their dominant hand should be on the bottom. Take a host saying: “The Body of Christ”. Have your child respond by extending their hands forward bowing slightly as they say: “Amen”. Have them take the host from their hand and eat it. Remind them that we never grab at the host. We allow the Eucharistic Minister or Father set the host in the palm of our hand. Remind them to slowly eat the bread, keep their mouth closed while chewing and never take it out of their mouth or make funny faces as they eat it. Show your child how to receive the cup using both hands. Have your child respond: “AMEN”. Have your child take the cup with both hands and take a sip of the wine. Have your child carefully give the cup back to you. Use the purificator(cloth) to wipe the cup. If your child is hesitant, please try to have them try it and let them know that just having their lips touch the cup is showing reverence and is still considered receiving Jesus’ special gift. Remind them to never spit it out, wipe their mouth off or make funny faces when they receive it. Share with your child what you say to Jesus after receiving him. As a sign of reverence, we keep our hands folded as we walk back. After receiving Holy Communion, we return to our pew and thank Jesus. Some people even keep their eyes closed in their pew so they can think about Jesus. Share about this special time to be with Jesus. You may also talk about a special prayer you might say after or read the one you made during centers. ​Please click on the presentation or use the arrows at the bottom of the presentation to advance to the next slide.